The U.S. Environmental Protection Agency (EPA) estimates that poor indoor air quality is one of the top five leading factors affecting respiratory health in the country. Millions of Americans suffer from breathing disorders that can affect their ability to get a good night’s sleep. Do you, or does someone in your family, suffer from Environmental Illness or Chemical Sensitivity? According to the Asthma and Allergy Foundation of America (AAFA), chemical sensitivity is related to exposure to natural, or man-made pollution, indoors and outdoors. This includes pesticides, plastics, synthetic fabrics, scented products, petroleum products, and paint fumes. Additional pollutants that may cause respiratory illness include sulfur dioxide, ozone, nitrogen dioxide, cigarette smoke, wood burning stoves and building-related illness. Ah…back to school season…. The time of year when all the germs jump back into our lives. The time of year when that first sickness of the year shows up and spreads through the family like burning leaves. The time of year where you’ll do anything to keep the germs out of the house just a little while longer…. Yes, the struggle is real. 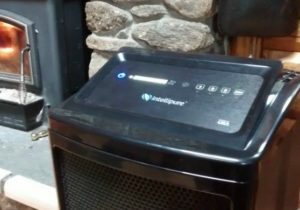 This is why the American made Intellipure Ultrafine 468 air purifier has been a welcome addition to my home this year.